"The excitement one experiences reading the Polish and American poet Ewa Chrusciel's new book is hard to describe. If one made an amalgam of Darwin, early Hejinian, Byzantine art, near Eastern books of wisdom, Ponge, Pavese, sacred Hopi and Amerindian texts, one still wouldn't be able to come up with the magical contraband this vessel is carrying. It is thrilling, wild and salvific. The book is written by an immigrant, and that immigrant is the human being. All is a source of wonder and horror to this species. It is looking everywhere for clues as to what borders are--what they are for, what happens when one breaches them, who does one become when one adopts the mannerisms, the habits, the intelligence of one's hosts. What is the host. In poems seeking safe passage through institutions secular and transcendent, through signals given us by the natural world, by habit, custom, sign, disguise, these urgent works explode onto the American poetic landscape. Authenticity emanates from every word, as well as originality, sassy humor and bracing images, objects, rituals, and queries from cultures in every old world trying to find right translation into this so-called new one. I would listen closely to what the ancient and near-extinct Hoopoe conveys. It really knows something crucial." "Following up on the strong promise of STRATA, Ewa Chrusciel returns with an impressive new volume that confirms her place as one of the most compelling and intellectually stimulating new poets." "This is a collection that knows no boundaries—in fact, it is wholly engaged in transgressing them, transforming them, transcending them. And Chrusciel makes ingenious use of birds to do this—the rukh, the hoopoe, and the hummingbird; the parrot, the partridge, and the bird of paradise. She uses the lines they inscribe on the sky to stitch together different ages, different spaces, and different dimensions, creating a marvelous convergence of the mythical and the remembered. She uses smuggling to do this too—a lot of smuggling. “I am crossing the borders with this coiffure of feathers.” She definitely has something up her sleeve." Contraband of Hoopoe is a series of braided poems and prose poems that interrogate the issues of dislocation, immigration and cross-cultural desire. Moving fluidly between the lucid and the ludic, Chrusciel invents a poetics of smuggling as she crosses national, historical and linguistic borders. The migratory narrative is thus distinctly errant, haunted as it is by a childhood lived under a Communist regime, by the austerity of Eastern block politics, and by the possibility of discovering a fleeting language in whose very excesses are carried the seeds of illicit revelation, spiritual transformation and insight. The book also elevates smuggling to a noble activity, recording how the Jewish people were hidden and transported during the Holocaust. One of the guiding totems of the book is the hoopoe, that bird of exile and return, which King Solomon sent to the Queen of Sheba to convert her to his faith. Under the aegis of this mythical bird, Chrusciel tracks a series of historical objects, undeclared beliefs and secret messages that immigrants throughout history have been sneaking through customs, past border checkpoints, and across the seas. Out of the rollicking oscillation of these themes, Contraband of Hoopoe tells a distinctly postmodern story, woven from the lives of countless immigrants past and present, through the contingencies of a poet who has migrated from Poland to the United States. 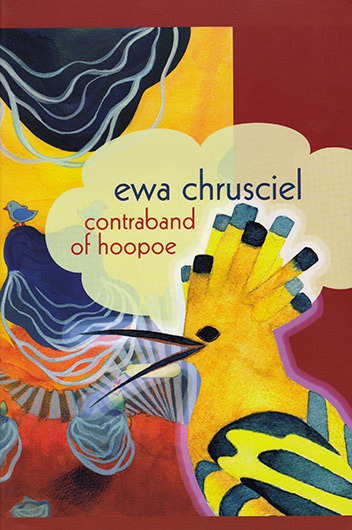 Ewa Chrusciel has two books in Polish: Furkot and Sopilki and one book in English, Strata, which won the 2009 international book contest and was published with Emergency Press in 2011. Her poems have appeared in many books and magazines in Poland, England, Italy, and the United States, including Jubilat, Boston Review, Colorado Review, Lana Turner, Spoon River Review, Aufgabe. She translated Jack London, Joseph Conrad, I.B. Singer as well as some contemporary American poets into Polish. She is an associate professor of humanities at Colby-Sawyer College. — 2015. Lynarra Featherly. Tupelo Quarterly. — 2015. Ally Harris. Heavy Feather Review. April 22nd 2015. — 2015. Liz McGehee. The Volta Blog. March 16th 2015. October 1, 2014 | 7 p.m.
October 4, 2014 | 6 p.m.
October 7, 2014 | 7 p.m.
October 10, 2014 | 6 p.m.
October 16, 2014 | 7 p.m.
October 19, 2014 | 3 p.m.
October 22, 2014 | 2 p.m.
October 29, 2014 | 4 p.m.
November 7, 2014 | 7 p.m.
November 17, 201 | 7 p.m.
April 15, 2015 | 8 p.m.
May 20, 2015 | 7 p.m.